Beckham joins Mudcats, Minter to Miss. 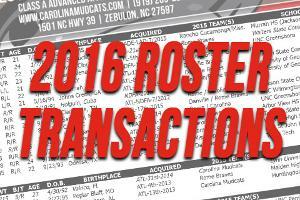 ZEBULON, NC - The Atlanta Braves announced several player transactions today with four affecting the Carolina Mudcats active roster. The roster moves included the transfer of INF Gordon Beckham's Major League rehab assignment from the GCL Braves to the Mudcats, the promotion of LHP A.J. Minter from Carolina to the Mississippi Braves, the suspension of LHP Chase Johnson-Mullins and the transfer of RHP Chad Sobotka from the Rome Braves to the Mudcats. The Mudcats roster is currently at 24 active players with one Major League rehab assignment, eight players on the disabled list and one on the suspended list. Beckham will wear jersey No. 37, Sobotka will wear jersey No. 48 and LHP Phil Pfeifer will wear jersey No. 16. Beckham, 29, was placed on the 15-day disabled list on June 2, 2016 with a left hamstring strain and most recently spent part of his rehab assignment with the GCL Braves. He is in his first season with the Altanta Braves and his eighth season overall in Major League Baseball. He was signed as a free agent last December by Atlanta and was originally drafted in the first round (8th pick) of the 2008 amateur draft by the Chicago White Sox out of the University of Georgia. Minter, 22, pitched through eight consecutive scoreless appearances with the Mudcats after joining the club in late May (5/22). Minter pitched to a 0.00 ERA over 9.1 innings with Carolina and totaled 10 strikeouts against four walks. He also held opponents to a .100 average against and gave up three hits over his eight games.